Perhaps you're like me and watch the Urban Sketchers main flickr group closely. If you look to the left, depending on how your view is configured, you will see "Discussions". A few of us here in Seattle have enjoyed participating in the Weekly Theme discussion. It's a way to get some inspiration and ideas about what to sketch. I often go out to do a new sketch just for the theme. This week's has been "Oddities in Your Town". We certainly have a lot of those in Seattle! I've added several that I sketched previously but I did go out to capture one local oddity that Tina found on a website. 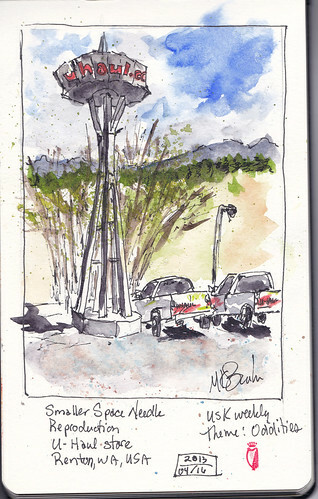 This U-Haul Space Needle is only a couple miles from me. This one stands perhaps 40 feet tall in the parking lot of a U-Haul rental business.